New graphics convey the READY TO RACE character of the 2018 KTM EXC-F model line. 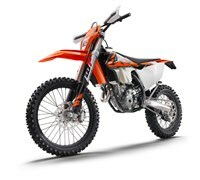 The light and compact KTM 250 EXC-F engine delivers class-leading torque and power over the entire rev range. The architecture with an optimized shaft configuration makes for excellent mass centralization and effortless rideability, at only 60.8 pounds. And that’s including the comfort of an E-starter. The power curve reaches for the sky over the entire length of the rev range, begging for another gear at 12,800rpm. This makes the new KTM 250 EXC-F brilliantly suited to both amateur riders as to pros at the peak of their ability. The centerpiece of the compact DOHC engine is this cutting-edge cylinder head. It features light, dual overhead camshafts with friction-optimized cam followers boasting a hard DLC coating. Four lightweight titanium valves and high-flow ports maximize the flow rate for an optimal power band and outstanding performance across the seemingly endless rev range of 12,800rpm. Two lateral stays allow an efficient fixation of the engine to the frame and reduce vibration. The KTM 250 EXC-F is fitted with a unique E-starter as standard, which is a clear advantage when it comes to crunch time in the heat of battle. A strong starter motor made by Mitsuba will fire time and time again at the push of a button. Even under extreme conditions, thanks to its more heat resistant O-ring. The design of the die-cast engine crankcases allows for a centralized shaft configuration, moving the crankshaft close to the bike’s center of gravity. This means quick and agile handling. The engine covers feature an advanced surface structure to reduce the wear caused by the rider’s boots. The state-of-the-art Keihin engine management system with electronic fuel injection features a 42mm throttle body. Thanks to its unique injector position, the engine’s response gives a whole new meaning to the word ‘instantaneous’. Separate circuits for cold-starting and idle make on-site adjustments easy. Push the throttle back when the engine is warmed up and the cold start mode disengages. The WP Xplor 48 upside-down fork is a split fork developed by WP in close collaboration with KTM. It is fitted with a spring on both sides but features separated functions for each fork leg: compression damping is fitted on the left side, while rebound is on the right. So the forks can easily be adjusted with the twist of a dial on the top of the forks. New outer fork tubes and a reworked setting make for more sensitivity, improved damping behavior and a reduced weight. In addition, a sealed hydro-stop guarantees excellent resistance to bottoming-out. Due to high-quality materials and a state-of-the-art production process, the new WP Xplor 48 fork – with approx. 300mm of travel – has outstanding response and damping characteristics. A comfortable preload adjuster (standard for SIX DAYS models, retro-fittable for standard models) allows for a simple spring preload setting in three steps without tools (standard, +3mm, +6mm). The WP Xplor PDS is a newly developed shock absorber. The PDS is a KTM trademark feature where the shock absorber is directly connected to the upper side of the swingarm. This setup boasts the best possible mounting geometry and provides amazingly progressive damping. The shock absorber is mounted close to the centerline, which means nearly symmetrical loads for the swingarm and frame and more space for the exhaust system. A second piston works together with a closed cup (instead of a needle) towards the end of the stroke and is supported by a progressive shock spring for exceptional bottoming resistance. Various machined and anodized components and a distinctive WP color trim make this a valuable, high-end product compared to the less refined shock absorbers of the competition.